DAWSON-WAM installed a dual cofferdam system for River Crossing 33 of the Milford Haven to Aberdulais 120km gas pipeline project being implemented by main contractor Land & Marine for National Grid Transco. The 1220mm dia. steel pipeline is designed to carry natural gas from the Milford Haven Liquid Natural Gas plant into NGT's National Transmission System, and was under construction during 2007/8. 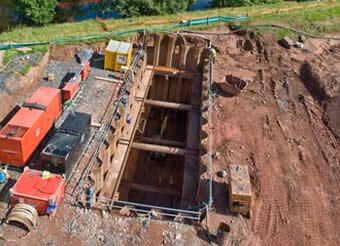 The cofferdams were required to enable the pipeline to pass under the River Usk near the A40 highway at Brecon, South Wales. The steel sheet piled cofferdam installation dimensions were 18m x 6m and were excavated to a depth of 10m. On the south bank of the river, the drive pit cofferdam was designed for the commencement of the under river bore with a thrust pad construction for the Tunnel Boring Machine (TBM). A reception pit on the north bank was installed diametrially opposite for the exit of the TBM and the conclusion of the bore. Due to the high water table contained within the variable river bed deposits, prior to commencement of excavation to formation, each cofferdam was dewatered by DAWSON-WAM's Client AMEC Tunnelling. Each cofferdam was internally braced with two 914cm x 305cm frames including 2 tubular bracings at 6m centres. The first of these was installed at -3.5m from existing ground level and the second at - 8.5m. AMEC Tunnelling (now Morgan Est), installed the thrust wall in the drive pit which provided the jacking pad for the TBM. 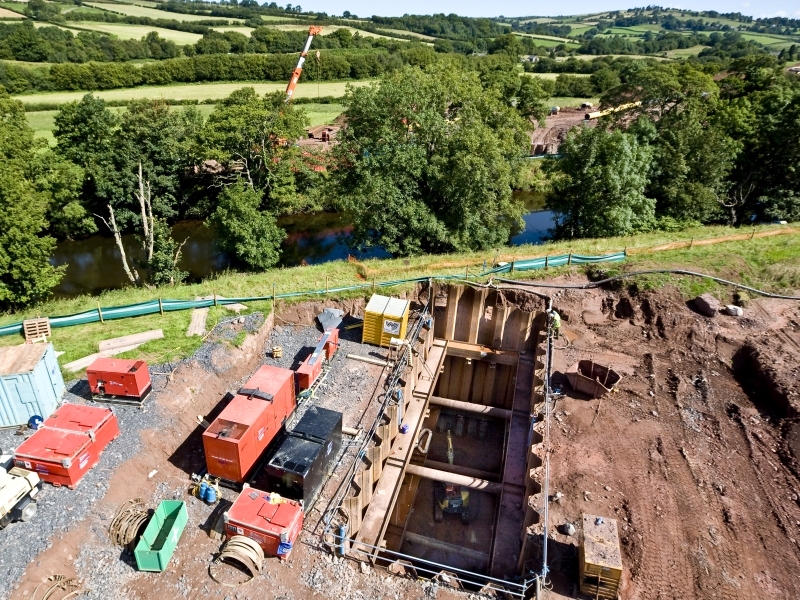 A reinforced concrete base slab was also installed in each cofferdam. The bore hole beneath the river was first lined with 1.6m dia. concrete casing pipes before installation of the gas pipe. With the tunnelling completed and the pipeline successfully installed, the cofferdams were decommissioned by a process of back filling with the material which had been excavated, and final removal of the sheet piles. The land could then be reinstated and returned to its owners for its former uses. The time frame for the DAWSON-WAM contract, which also incorporated a similar river crossing - Crossing 17, was 11 weeks in total.